Most baby retiring boomers are concerned with one thing. Will I have enough money to enjoy ALL of my Retirement! We see this all over commercials we see on television these days? 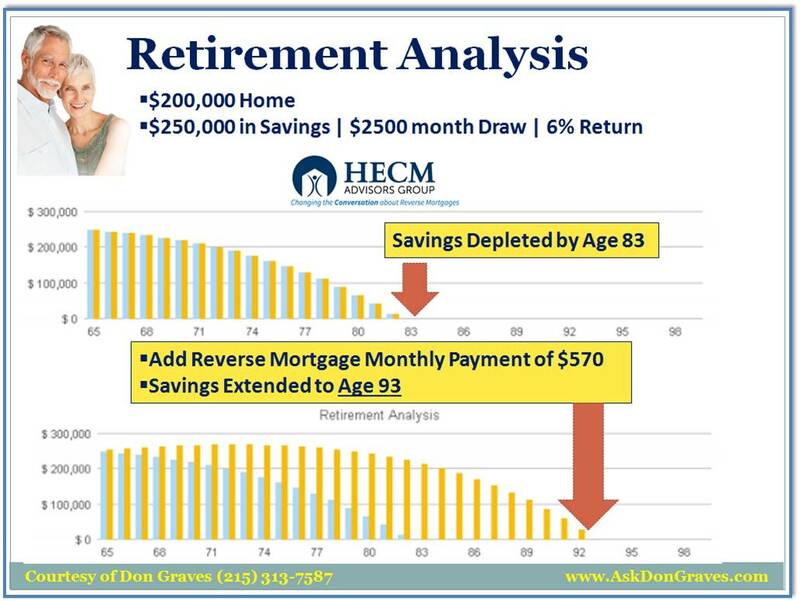 Below is an example of two ways a Reverse Mortgage Can Help Answer that Question. PROFILE: A 62 year married couple wants to retire. But is concerned that their modest portfolio of $250,000 may not be enough for all of their years. They have a certain lifestyle they want to maintain, but would love a little more certainty. ASSUMPTIONS: The client will be drawing $2500 per month from savings; this will adjust by 4% year. Their return is 6% each year. Both of these reduce the draw on Savings, so they don’t have to draw out as much per month. And the IMPACT! Retirement Savings last 10 ADDITIONAL YEARS! The Reverse Mortgage has changed dramatically with regards as its usage as a tool for advisors to help more of their clients. It certainly is not always the answer or the conclusion, but it should be part of the Conversation. We have used this analysis with portfolios up to $2 million. See below and HERE for that Article and click below to watch the 2 minute video.